Skinners Life Senior Dog Food is a complete meal that has been specially formulated to be wheat and gluten free for older, less active or overweight dogs. Made with easily digestible chicken and rice that is lower in protein and fat to help dogs lose excessive weight, the food has also been coated in suitable levels of sunflower oil to help maintain a healthy skin and coat. 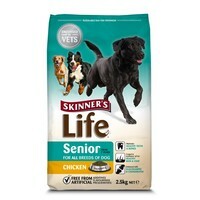 Skinners Life Senior also contains enhanced levels of glucosamine and chondroitin to help protect your dog’s joints.